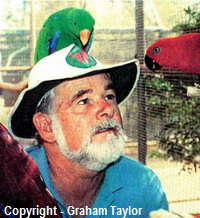 Since establishing the Australian Bird Park as a breeding, study and display centre for Australian parrots and cockatoos I have experienced problems with snakes. Over 140 snakes have been removed from our park during the last three years. In that period we have lost thirty birds to snakes, so they pose a considerable problem. Birds at risk include Macaws, Eclectus, Fig Parrots, Black Cockatoos, Cloncurry parrots, Blue Cheeks and many other rare and expensive parrots. Recently a blue and gold Macaw was attacked by a scrub python. Fortunately it was rescued alive but minus its tail feathers and a little blood. Other breeders around Cairns have similar problems. One finch fancier lost seventeen birds to a tree snake before he found it in a nest box at one end of the aviary. When constructing the flights special attention was given to snake proofing. Smaller parrots were housed behind 3/8 inch bird wire, but larger parrots, macaws and cockatoos were housed behind 3" x 1"arc mesh. We would be extremely grateful to any member who could suggest a practical way of excluding snakes from our aviaries. "regarding the snake problem I am afraid I don't have any answers to that problem. I am now back in NSW and I still get the odd python. I do know that a few breeders have had some success with a hot wire (a fine wire erected around the outside of the aviary connected to a 12 volt battery). Other than that you just have to be on the lookout for them during spring and summer. One thing, my birds seem to let me know when there is one in or under their aviary." If you are reading this article and you feel you could contribute from your own experiences in protecting your birds from snakes, or if you share this article on social media and get some positive comments that you feel may be helpful for others, please do not hesitate to contact us and we will add your comments to this article (feedback request added 9/06/2014).